Bet people have asked you this question many times! That´s because choosing your job will be one of the most important decisions in your life.To begin with, you need to know yourself: be honest about your likes and dislikes. Think of any ability you have or a special personality trait that makes you different . Don´t limit yourself or let other people tell you what you can or can´t do.Keep open to options. You and your interests will change as you continue to grow up. But most of all, think of a job that you truly love and feel passionate about... So next time someone pops up the question: What do you want to be when you grow up ? guess you could just answer... HAPPY ! ! Have you ever been teased by your sister or brother? Maybe you tease a good friend or you are teased by them at some point. This is something that happens very frequently and it is not wrong if both of you find it funny. But what happens when teasing is constant and makes other people feel bad? That is what we call BULLYING. Sometimes we think that bullying is only a repeated aggressive physical behavior, but it is not only that. Bullies not only hit, they also throw things, pull hair, kick, call names, threat and tease constantly their victims. The victims are generally smaller or weaker than them and are afraid to tell others what is happening. 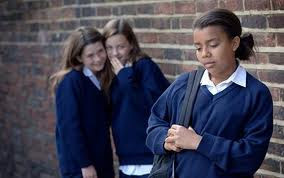 Bullying is becoming a real problem not only among teenagers, but even worse among preschoolers. As a child you have the choice to fight bullying. It is up to you to decide if you want to be a friendly, kind and respectful person and become a good leader or if you want to be nasty and mean to become a bully. What do you rather be? What is your opinion about bullies? Why do you think they want to hurt others?